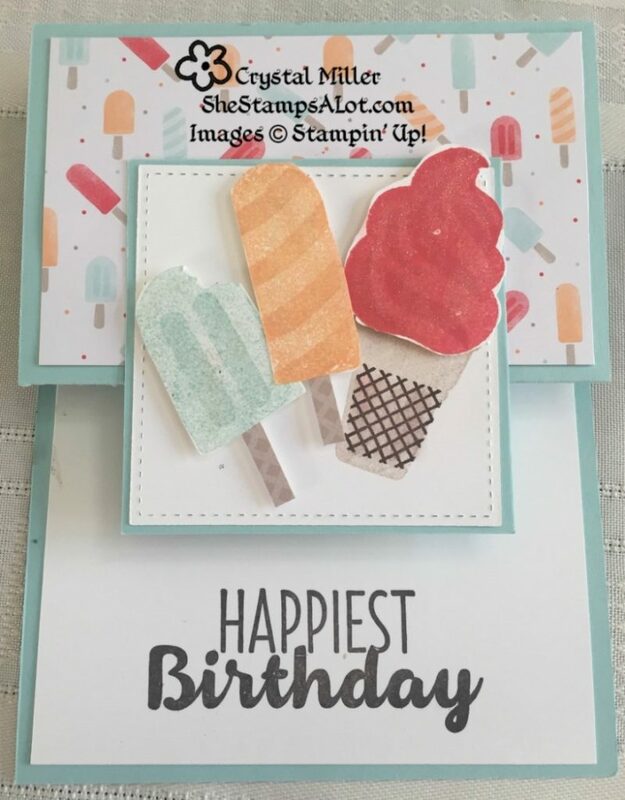 Cut Pool Party 4 ¼ x 11 and a scrap for the square, Whisper White 4 x 5 ¼ and a scrap for the stitched square and for the three cool treats, cut Tasty Treats DSP 4 x 2 ½ . Score the Pool Party at 2 ¾ and 5 ½ . Fold the card so that the z fold is on top, adhere the DSP to the top of the Z fold. Stamp Happiest Birthday at the bottom of the Whisper White 4 x 5 ¼ . Adhere that to the card base bottom. Use the Square Thinlit to cut out your Pool Party Square, use the Stitched Framelit Square to cut out your Whisper White Square. Adhere them to your DSP at the Fold. Stamp your three Cool Treats, I cut them out by hand, but you could use the thinlits to cut them also. Mount them to the square with dimensionals and adhesive. I also used Wink of Stella Glitter Pen on my treats.